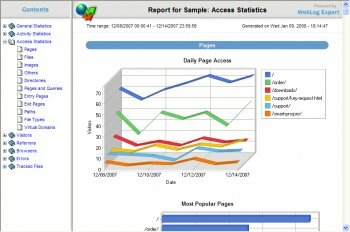 WebLog Expert is a powerful access log analyzer. It will give you information about your site's visitors: activity statistics, accessed files, paths through the site, information about referring pages, search engines, browsers, operating systems, and more. 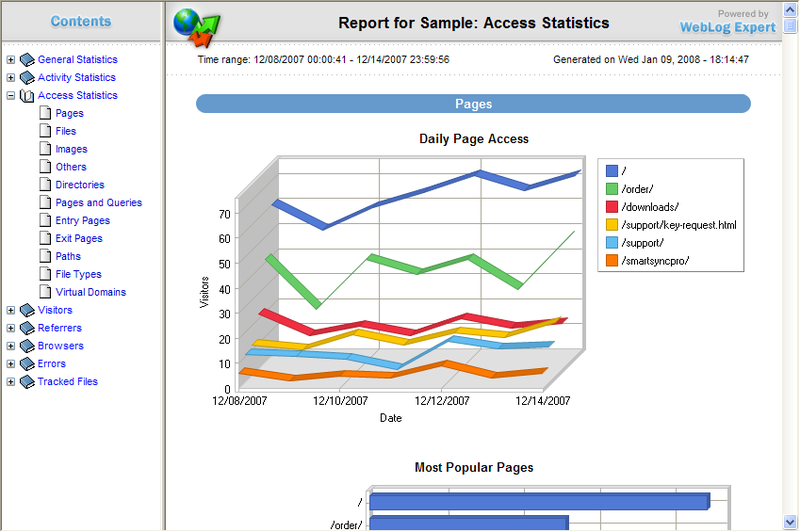 The program produces easy-to-read HTML reports that include both text information (tables) and charts. Ummm, yeah, ever heard of cpanel? Klaus, I agree with you completely. That's why you should definitely check out Web Log Storming. It's also a log analyzer, but with a twist: you can interactively browse through stats and dig out pretty much anything that you can imagine. There used to be a time that this was a great package. Fast and provided basic statistics. But it now has forgotten to evole and still only provides basic functionality which doesn't justify its price. Google Analytics can do so much more and give real insight on what is happening on your website. WLE just provides some graphs and statistics and getting meaningful information out of it is just about impossible. I had WebTrends on one of my servers. I wanted to upgrade, but they were too costly. Weblog Expert gives me the same results with a very reasonable price. I can automate the analysis, which is very helpful for my stakeholders. Recommended. I've used WebLog expert in the past and I think it's a great tool for the money. As for it looking like so many other products. Have you ever seen the output from WebTrends? They all pretty much generate the same information in very closely the same way. Probably because one of the big guys (like WebTrends) does it this way and they want people to be familiar with the data. Plus - the ribbon graphs are fairly plain - something you can do easily in Excel and most graphic packages throw that in. Ideal balance between functionality and usability. It seems that guys from Nihuo copied design and layout of WebLog Expert. WebLog Expert was released much earlier than Nihuo Web Log Analyzer. This is really bizarre, I have used a product almost identical to this by a company called Nihuo. Check out these two demo sites. They are identical (other then the different graphics). Perhaps they are the same company or there is some bizarre code espionage going on. I use Nihuo and love the product. Curious that these would be the same??? I really like this program. The only comment I can make is around the ability to customize search engines in the report. None of the Australian search engines show up in the search engine report, and the ability to add these in through the options menu would be great. Do this and you'll get 5 stars! There are no changes noted for WebLog Expert 3.1 Beta 2 -- which means that I have no reason to try this out! I need to know what's new and why I should look forward to the upgrade. Yes, I have a license for this product and use it to run nightly reports! Update notes! It's not that hard! This demo seems ok. The beefier log analyzers generally have more settings you can modify for custom reports. Last week I started using Mach5 and it's much more customizable than WebLog Expert. WebLog Expert is comparatively simple, it has a clean interface but the reports may not be what you're looking for. Actually, the one report-format I find missing from all these web-log analyzers is this: a report of visitors (sortable by tld/domain/host), time/date, and referrer.